Remember you have to solve the words in the right order! 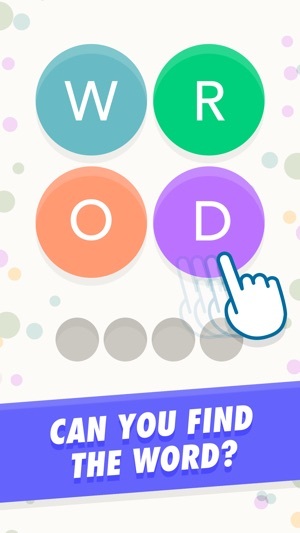 - WordBubbles offers more than 2 700 levels, from easy to difficult! - Get smarter… Sharpen your skills in vocabulary and spelling! - Every day you can play a new daily challenge and earn free bonus hints! 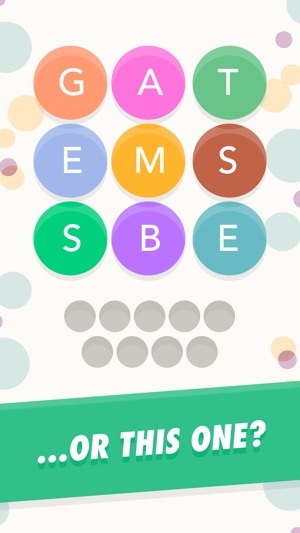 - It’s the perfect blend of brainteaser, word game, and puzzle! - Compete with your friends and follow their progress! - Easy to use, a challenge to beat! IMPORTANT: some users claim there is a bug in the game. It’s not! 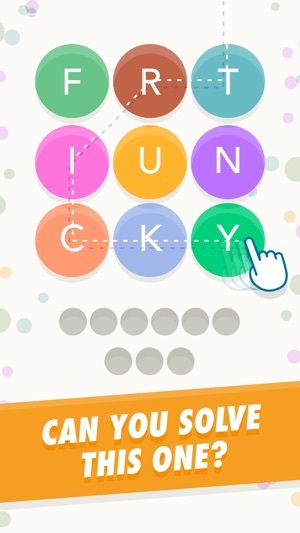 If you can’t connect the letters it’s because you have solved the words in the wrong order! The solution? 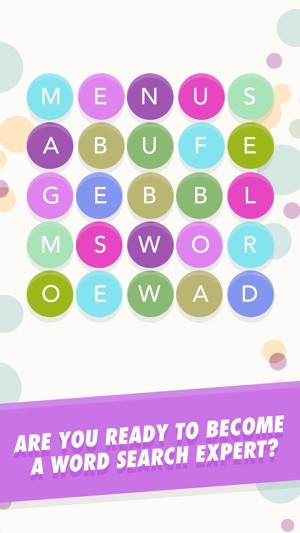 Restart the level by tapping the reset-button in the lower left corner, and try to solve the words in a new order! Good luck! Can you think outside the bubble? 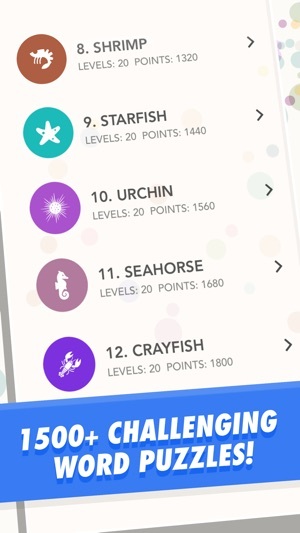 Start word-playing now and see how many levels you can beat! I love this game! It's much more challenging than your typical word search. There might be more than one path to make a particular word but only one is the correct way to be able to connect the letters for the remaining words. One of the things I really like (especially in the lower levels) is that there are a lot of red herring words that make it even more challenging. If you're looking for a quick-fix game this might not be for you. I'm in the Grey Whale set of puzzles and it often takes me multiple sessions to solve. I must have bought the minimal hint package to remove the ads which was, what, $1.99? Knowing now how much I enjoy Word Bubbles, I would gladly have paid more—shhh! With the daily hints that I earn, this is way more than enough. Don't use hints, do stretch your brain, that's the fun of the challenge! I have not had any of the technical issues other reviewers have mentioned. Update: I’m now up to level 1126, have amassed hundreds of free hints by religiously playing the daily puzzles, continue to love the challenge even when it takes me multiple sessions to see the words and/or solve the correct paths, and stand by my 5-star rating! I have played this game for quite sometime - but I have always waited on the timeline for the free hint. I played when at the doctor’s office, waiting in the car, etc. - “free” time. I NEVER purchased hints (games are not that serious to me). I “assume” I accidentally hit purchase hints - which, again, I never have done. This app did not take me through a process where I could cancel the option (again, “assuming” I inadvertently hit the purchase option); it simply gave a check mark in a “done” circle with the words “your purchase was successful” and an “OK” to hit. I did not press “OK” and had to turn my phone off to get out of that screen. Then, after powering up, I selected the app to see if that purchase had been cancelled, since I did not press OK, but it had not been. How can hints be purchased without a purchaser providing financial info AND no option to cancel? What form of payment is being used? I will delete this app, and warn others against it, if unresolved. I DID NOT purchase hints and want to know what is being charged! Further, I order online frequently for clothing, home goods, etc., and legitimate sites (or sites with integrity) give an option to cancel a purchasing process AND gives a summary of the purchase including payment method. I did not receive such a thing and I never provided financial info on this app. I am very concerned. The game is simple to learn, but as you advance it can become so challenging that it isn't fun. That's when I take a break for a few months to gather up free hints from the daily puzzles- because the hint packages for sale are ridiculously expensive. There are two major flaws that I see in this game, which keep me from giving it 5 stars. 1) You cannot pick the game difficulty that you want to play; you start at the very basic easy levels and work your way up. Sometimes, I want to focus in and work a devilishly challenging level, while other times I've got a few minutes to kill and want something easier to do. This game gets very boring when you get to the top levels and you're left with nothing but puzzles that will take you a long time to do. 2) There is no way to record the words you've found in the current puzzle you're working on. This is for the higher levels, where you've got multiple difficult words which have to be traced in a certain way or you risk not being able to complete the missing words. It isn't uncommon to have to restart a puzzle because you left a few straggling letters on the board that you can no longer connect. Unless you have written down your "known" words, or have a good memory for sometimes esoteric words, it's possible to forget those words when you restart. A Notes function within the game would be great!